The author Ann Rosmans website where you can read about her everyday and writes about books Fyrmästarens daughter, Requiem coffin, Porto Franco's guardian and Mercurium. Fall and winter have been filled with script work, but when I think back, it's not scripted work I will remember without a great loss and an honor. On November 26, when I sit in the car on the way to give a lecture at a library, I get a phone call. Stig Christoffersson, Marstrand Local Society honorary president and a dear friend of mine has passed away, 83 years old. The tears flow and I stop at a bus stop. My first thought is to go back home. Call the library and explain. But then I think of the Stig, he loved to tell of Marstrand and he thought that I spread the history and living did his island He probably wished that I was standing on that library and just told me tonight. So I drove on, wiped away the mascara and fought me through the lecture. And ended by telling the audience about my fine friend Stig. The funeral in Marstrand medieval church is amazing. The sun breaks through the gray clouds and shines comforting through the colored windows. Music by Evert Taube. A sea of ​​people and flowers that follow the coffin down to the dock when it is loaded at the Port ferry for one last trip. Several times during the screenplay for catfish, I have appeared on new facts and thought there where I have to check with the Stig. Someone once said that when an elderly person has died, it is as if a library has burned down. The parable can not be better. Just today I had wanted to call him and talk about the past week. That I as a rapporteur guest of honor on Thursday night standing on Swedish Ambassador's Residence in Berlin and display pictures and tell 53 invited guests. If Marstrand herring periods, Porto Franco, pirates and my love for this island to the wise, warm Cultural Marika Lagercrantz appreciate what I do, like my stories. 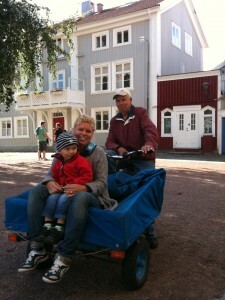 One of the pictures that I show is the Stig, he sits on the flatbed mop with me and my youngest son as a passenger. I hope he is from above, see that I'm doing what I can to move the story forward. The author Ann Rosmans website - here you can read about Ann's author living and her books Fyrmästarens daughter, Requiem coffin, Porto Franco's guardian and Mercurium.